The SHW Group, a technology leader in the production of automotive components, has chosen Italpresse Gauss for the development and installation of new casting cells for the production of high-end brake discs. With a long metallurgical tradition, the roots of SHW Group date back as far as 1365, when its forerunners first poured iron in the Swabian Jura region of Germany. Today, SHW Group operates worldwide with plants in Germany, Canada, Brazil and China. This long-standing experience enables SHW Group to develop innovative automotive solutions thanks to its specialism in pumps, engine components and brake discs. The automotive industry constantly faces new technological challenges, a characteristic of the sector that serves as a driver for research and development activities at SHW Group. To meet the needs of customers and the market, the company continuously works to develop new technologies and product solutions. Care is taken to ensure quality, safety, environmental protection and economic efficiency in line with the requirements of production processes. Engineers, technicians and experts at SHW Group, are always up-to-speed on the latest trends, and they work side by side with customers to develop new products and solutions. The co-operation between SHW Group and Italpresse Gauss began in 2016, when the company chose Italpresse Gauss as the supplier of a new gravity die casting cell for the production of high-end composite brake discs. 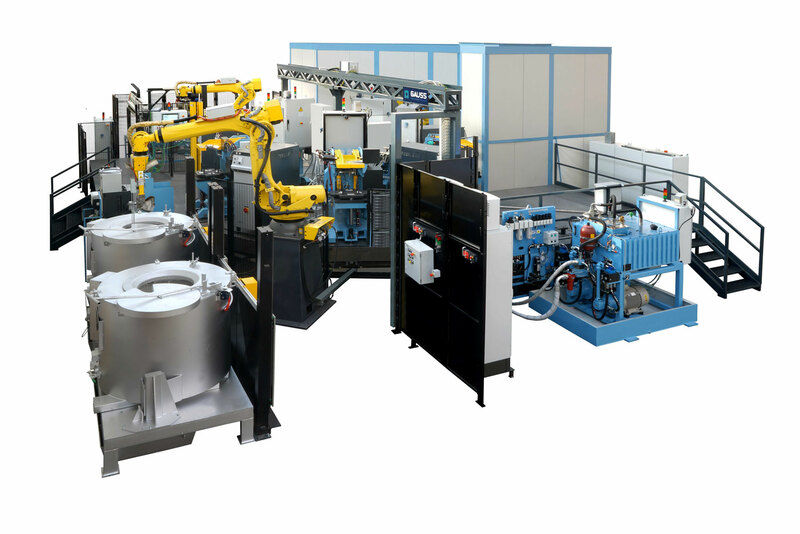 The solution, which is now in operation, is made up of five gravity die casting machines installed on a carousel table, complete with core setting, pouring and extraction robots. SHW’s aim was to optimise the quality of the cast parts and ensure steady, careful control of the process ahead of the aluminium casting phase. They therefore asked Italpresse Gauss to develop and integrate a system for the handling and temperature monitoring of the friction ring. by dividing the detected image into various sectors, specific temperature data for each sector is obtained as the ring heats up. The advantage for the customer is that operators are constantly informed of the specific temperature of the various zones during the process, ensuring that the entire ring has reached the right temperature before being inserted into the mould. The operator is also guided through the heating procedure, making sure the ring reaches its optimal temperature within the desired timeframe. This solution is part of a broader effort by Italpresse Gauss and Norican Group to increasingly connect man and machine, equipment and processes in the spirit of Industry 4.0. Having been impressed with the operational casting cell, SHW Group chose to work with Italpresse Gauss to deliver a second casting solution. This was commissioned just a year after the start of the collaboration. Italpresse Gauss’s new HMe machine control and data system enables advanced data processing, analytics and remote control, getting the die casting process ready for Industry 4.0. ECO-FIT unlocks energy savings of up to 60% by optimising the controls of the hydraulic pumps on die casting equipment. It can easily be retrofitted too.